It’s a good idea to add some fats to your dog’s diet. Omega-3 oils like fish oils can minimize inflammation and help protect against conditions like arthritis, heart disease or even cancer. And who doesn’t love giving coconut oil to their dog? Coconut oil has anti-inflammatory properties, but it also helps guard against antibacterial, antiviral and antifungal infections and it helps maintain a healthy skin and coat and digestive system. But it turns out giving your dog extra fats in his diet isn’t quite as simple as adding a bit of fish or coconut oil to his food. 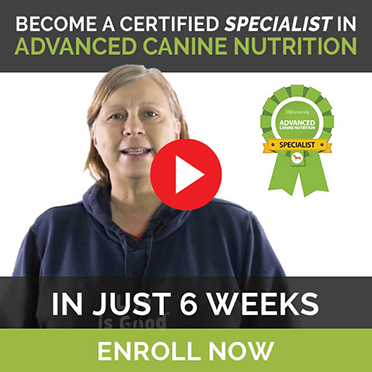 There are different types of fat that can benefit your dog’s health … and the fat you should use varies depending on what type of protein you’re feeding him. Nutrition expert Steve Brown has done a ton of analysis on this subject and we looked to him for answers. Steve’s primary passion is teaching veterinarians and other technically-minded dog feeders and influencers how to formulate fresh food diets that meet ancestral, AAFCO and FEDIAF (EU) standards. He co-au­thored See Spot Live Longer in 2004, and 2010 wrote the highly praised Unlocking the Canine Ancestral Diet. Steve is also a consultant to several fresh food manufacturers, including Darwin’s and Raw Bistro. At the Natural Canine Health Symposium (NCHS) in 2014, Steve gave a talk called Better Fats, Better Dogs. He explained how feeding properly balanced fats can improve not only your dog’s health and longevity but even his mental abilities and his behavior. He also told us about the best fats to add to your dog’s food, depending on what proteins you’re feeding as part of your dog’s raw meat diet. We’ll give you a simple guide to balancing fats for your dog in a minute. But first, some background on fats. You know the expression “you are what you eat.” Well … your dog is the fats he eats. When your dog eats fats, they’re incorporated right into the cell membranes of every cell in his body. Healthy cell membranes are the foundation of good health … and unhealthy membranes can make the cells less efficient, affecting your dog’s organs and entire body. Research shows that feeding enough fats, in the right balance, can develop better brains and better behavior. Puppies learn faster and remember more, and older dogs stay mentally sharp. Properly balanced fats also support better eye and heart health and develop more muscle and less fat in the body, leading to better athletic performance. Overall, if you feed your dog the right fats, he will have fewer health problems (which helps him live as long as possible). Fats need to be high quality and absolutely fresh. Fats turn rancid quickly, and rancid fats can create chronic health problems. Rancid fats reduce the nutritional value of the food, can cause diarrhea, liver and heart problems, macular degeneration, as well as cell damage, cancer, arthritis and even death. That’s why you don’t want a kibble with added fats. The fats will spoil quickly once the bag is opened and the food is exposed to oxygen. There are five essential fatty acids (EFAs) for dogs. They are all polyunsaturated fats – known as PUFAs. All these fats are “essential” because your dog can’t make them himself. They must be included in his diet. LA is an Omega-6 fat, found in hempseed, soybean, safflower, sunflower and corn oils. Lack of LA is linked to coat and skin issues and can make your dog sluggish. ALA is an Omega-3 fat found in flaxseed, chia seed, hempseed and walnut oils. Dogs primarily use ALA to make EPA and DHA, which are essential for body, brain and eye health. AA is an Omega-6 fat found in meat, poultry and eggs. AA is a brain fat and lack of AA in a puppy’s diet can produce a “dumber” adult dog. EPA is an Omega-3 fat found in oily fish like salmon, herring and sardines. Lack of EPA is linked to depression in mammals. EPA also considered the anti-inflammatory fatty acid. DHA is an Omega-3 fat, also found in oily fish. DHA is essential for brain and eyes. Animals lacking DHA don’t think as quickly and don’t remember, see or hear as well. All PUFAs are fragile. They must be protected from oxidation or they can do more harm than good to your dog. When deciding what fats to add to your dog’s food, it’s best to start with lean meat. The ancestral diet included wild prey, which is much lower in fat and higher in protein than today’s domesticated feed animals. While we don’t know exactly what dogs’ ancestral diet contained, several research studies suggest it would have been about 85% whole prey animals, with small amounts of fish and eggs, and about 10% to 15% scavenged grasses, berries, nuts and other vegetation. Prey animals would include mice, rats, deer, chickens, rabbits, reptiles and amphibians. Whole prey includes all parts of the prey animal – right down to the fur, bones, eyes, tongue and all the organs and glands. So that’s what’s in the Ancestral Diet line in the chart below. You’ll see the lower fat content and higher protein compared to most domesticated meats your dog might eat. When you feed beef, it’s best to use 90 to 93% lean beef – or at least, no fattier than 80% for adults or 88% for puppies. And when you feed chicken parts like necks, backs and thighs, remove the skin and separable fat from half to three quarters of the parts. The meats should be fed raw. Even if you choose to lightly cook the meat, don’t ever cook bones. For safety reasons bones should always be raw, even if ground. Cooked bones can splinter and cause internal injury to your dog. First, what are you feeding? The examples that follow use beef (ruminant) and chicken (poultry) as a guide. Ruminants are plant-eating mammals with four chambered stomachs, like cows, deer, buffalo, sheep and goats. Poultry are birds raised primarily for meat and eggs, including chicken, duck and turkey. It’s a good idea to rotate ruminant and poultry meats to balance the saturated and polyunsaturated fats. Most domesticated ruminant meats contain too much saturated fat (SFA) and not enough polyunsaturated fat (PUFA). On the other hand, even lean chicken parts (necks with all the skin and fat removed) have a lot of PUFAs, which doesn’t leave much room to supplement the EFAs. Rotating ruminants and poultry provides a much better foundation to balance the fats in your dog’s diet. Which Fat For Which Meat? It’s really important to add the right kind of fat to the right kind of meat. If the fat in your dog’s diet is out of balance, adding the wrong kind of fat can increase the imbalance and cause health problems. Even if you’re feeding a wider range of meats than just beef or chicken, you can apply the beef rule of thumb below to other ruminants. Use the chicken rule of thumb for other poultry. Note the addition of a small amount of canned sardines to each rule of thumb below. We’ll talk about sardines and other fish a little later. Beef is high in saturated fats and low in polyunsaturated fats. Beef doesn’t meet minimum requirements for LA and ALA, so these EFAs need to be added. Hempseed oil provides both LA and ALA in an ideal ratio of Omega-6 to Omega-3 and is the best choice of oil to supplement a beef diet. Walnut oil is another one that works well with beef. Chicken is high in polyunsaturated fats, especially LA. Don’t add any foods containing LA to your dog’s chicken diet. Instead, add ALA rich foods such as ground flaxseeds, flaxseed oil, chia seeds or chia seed oil. Here’s an easy, at-at-glance list of which oils to use for which type of meat. Steve recommends adding sardines to the diet to provide DHA and EPA. Some people just add fish oils, but sardines contain trace minerals, including iodine. DHA and EPA are very fragile and need to be protected in your dog’s body, and should be eaten with antioxidants and minerals. Adding sardines achieves this. It also avoids the risk of using fish oils that may be contaminated and are more likely to become rancid. Read more about the risks of fish oils. Instead, go with phytoplankton. It’s the foundational source of nutrition for the ocean and fish get all the omega-3s they need from it. It doesn’t have the heavy metals, radiation, BPAs, mercury and other problems found in fish and fish oils. Most dogs love sardines (and even the taste of fish oil), but don’t be tempted to feed more than the amounts recommended above. Excess EPA and DHA can slow your dog down mentally and make him age faster. This guide is just about balancing fats with different protein types. It doesn’t include any instructions for balancing calcium and phosphorus or other important nutrients. Varying the protein sources for your dog’s meals will help deliver a wider range of nutrients. Read about balancing calcium and phosphorus in your dog’s diet.